Flight delays and cancelations are never fun. Having trip delay insurance, though, can help take some of the sting away. And the good news is that most premium travel cards include it. 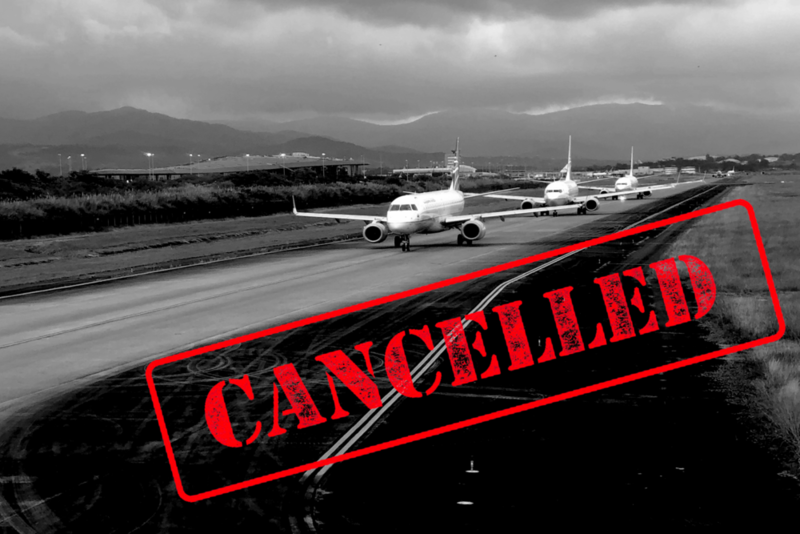 On our recent trip to San Francisco, our flight was canceled and rescheduled for six and a half hours later. Keep reading to find out how we filed an insurance claim, what was covered and why you need the coverage yourself. No one likes to be delayed at the airport. What Is Trip Delay Insurance? Sounds pretty good right? How do you get it? Most premium travel rewards cards offer some type of insurance. Each card is different though, and the terms and conditions always change, so make sure you check with your card company about what’s covered and for how much. For us, we used the Chase Sapphire Reserve card. With the reserve card, as long as you pay for some portion of the ticket with that card, you’re covered. We use points and miles to pay for all of our tickets, but there are always nonwaivable taxes and fees you have to pay in cash. For our SFO flight, that fee was 11.20 per ticket. We used the reserve card for the charges and were covered for the delay. Another stipulation with Chase is that the flight must be delayed at least 6hrs. We just made it since our trip was late 6.5 hours. Again this time varies by the card company, so verify the details for yourself. This applies to delays caused by the airline, not you. So if you miss your flight because you were late, the coverage won’t apply. We were delayed at our home airport before we had even left the house. If we had been stuck in an airport overnight, we would have had more expenses. The good thing about travel insurance is that it allows you to enjoy the time you're delayed. You can eat a nice dinner, sleep in a big suite and even do some shopping. I know you'd rather be at your destination, but it's a nice backup. If you're on a layover and your checked bags are still on the plane, it can be a lifesaver. Instead of having to come out of pocket for clothes, toiletries and a place to sleep, you can let your credit card company pay for it. The entire process from filing the claim, to receiving the check, took about two months. As with most insurance claims, they want to make it difficult, so that you get frustrated and give up. After going through it once, if we ever get delayed again, I'll know what to provide. The most important thing we learned, was to keep every email the airline sends you until your flight is concluded. You never know what they might want you to produce. I didn't have the original emailed itinerary that had my credit card number on it, and this slowed things down. Also, had I gone directly to the airline and asked for the flight delay verification, the claim would have been finished much quicker. I sent Eclaims several different documents and screenshots to prove our case but what they really wanted was one single email from AA with all the info in it. This was easy to obtain by filling out this online form on AA.com, but I didn't know that in the beginning. So, file as soon as you can adn keep all your paperwork. If you do that you should have no problem being reimbursed for your expenses. Filling out this form would have saved us a lot of time. We would have much rather arrived at our destination on time. But having trip insurance made the process bearable and didn’t cost us anything to have. Before you book your next flight make sure you’re using a card that gives you some protection. Our favorite is the Chase Sapphire Reserve, but there are several other good options. It could save you a lot of money, especially if it’s an overnight flight. At the very least you can have a nice dinner to drown your sorrows. What's the longest you've ever been delayed? Have you ever used trip insurance? Answer below in the comments.